I know it's been many months since I've last updated. A lot has happened since my last post and I've simply just haven't had the time to blog, between school, work, hobbying, and other stuff. I went to the NOVA Open in August. I had the pleasure of joining forces with Neil and Steve from the 11th company to play as "Team Podcast" or "Team Win at all costs" in the Trios tournament. We did quite well for our first time playing together, taking 2nd place out of 12 teams. Our team played Dawson and Silas from the Imperial Vox Cast. Well Neil and Steve played them. I was in the singles match against their third teammate, Joe Guardsman from the IVC forums, who was a very fun guy, but it was a pretty one sided victory for the Dark Eldar. I did alright in the singles tournament, going 5-3 overall, ending as runner-up in my bracket on day 2. First game, I played Dawson from IVC. He controlled the game very well, but I nearly stole it in the end with my DE contesting objectives. Also I got to have some fun games against Ciaran from the Overlords podcast, played against Neil in a friendly match. In September, I traveled out to California for Da Grand Waaagh, hung out with Carl from the Independent characters podcast as well as Bill and Dawson from IVC. I got in a friendly game against Carl at 'The Boiler Room' and watched in amazement as he rolled nothing but ones for difficult terrain and dangerous terrain. It led to a turn three rout of his Nurgle themed chaos army by my Dark Eldar. In the tournament itself, I ended up going 2-1-2. Had two games I could've won (I was winning in attrition), but didn't get enough done to win the mission, so they were both draws. The last game I played Bill from IVC. We had an excellent, fast played, fun game against his Raven Guard. I pulled out a win on the objectives, but it was a game more dominated by movement than shooting. In October, the Eternal Warriors podcast has gone on hiatus until January. We're working on some format adjustments and hope to be back even better. In the meantime, I've been steadily working on getting use out of models I normally don't use. Recently when I've been meeting for friendly games, I've made lists using all models I haven't played with in a long time. I played in the local Adeptus Windy City tournament with my Dark Eldar, but didn't do very well. I realize that I need to get more practice, as often I may only get 1-2 games total between tournaments. This month, I signed myself up for Adepticon. I barely managed to get a hotel room in time, and just barely got signed up for the events as they sold out super fast. I'm going to play in the 40k Championship Friday, Team Tournament on Saturday (Go Team Podcast! ), and the Warmachine Team tournament Sunday. I'm excited to play in these events, but I have no idea what I will bring for these events. I know I'll bring Skorne for warmachine. For 40k, I may try to get the Apollo Marines done by Adepticon. Also I ran the monthly Adeptus Windy City 40k tournament last weekend. We had 20 people for a spirited three rounds of play. Everyone seemed to have a good time and really enjoyed the twist I put on the standard roll-off for deployment. Here are the Tournament Pics that I took, showing the different games and interesting scenes. The things that surprised me were that there was only one Grey Knight player, one Space Wolves, and one IG player. I think it was just a case of people got bored of running the same armies for several months so they switched up and used different armies. I haven't been making many posts on the blog as I just haven't had time lately due to real life, between Grad school, full time work, friends and family. A recent crop of unexpected expenses has come up in real life that will cause this project to be suspended indefinitely. Recently I got into a car accident (nobody got hurt, I'm fine) and between the insurance deductible and traffic ticket I got, I got quite a setback in terms of money. This was quite a wakeup call to me and while I'm not facing huge problems, I really can't justify the costs of traveling to the Grand Waaagh as well as building an entire army just for that event and Adepticon. I do appreciate the support I had been receiving for the project. I was amazed at the reception I was getting when the idea hadn't really left the ground. I still plan to continue the blog with updates when I can. With me having to be a little tighter with my funds, I'll focus more of my energy on finishing the models I do have, as well as trying to develop and learn my modeling abilities. I already have several other 40k armies that need to be assembled and painted, as well as my Skorne for Hordes, my blood bowl teams, and the Seamus crew I have for Malifaux, so there will still be plenty for me to talk about on the blog. I'll leave you with a clip of the swansong of the Apollo program, Apollo 17, from the documentary "When We Left Earth: The NASA Mission." I know it's been a few weeks since I last posted on my progress regarding the Apollo drop pod army, but there hasn't been too much. 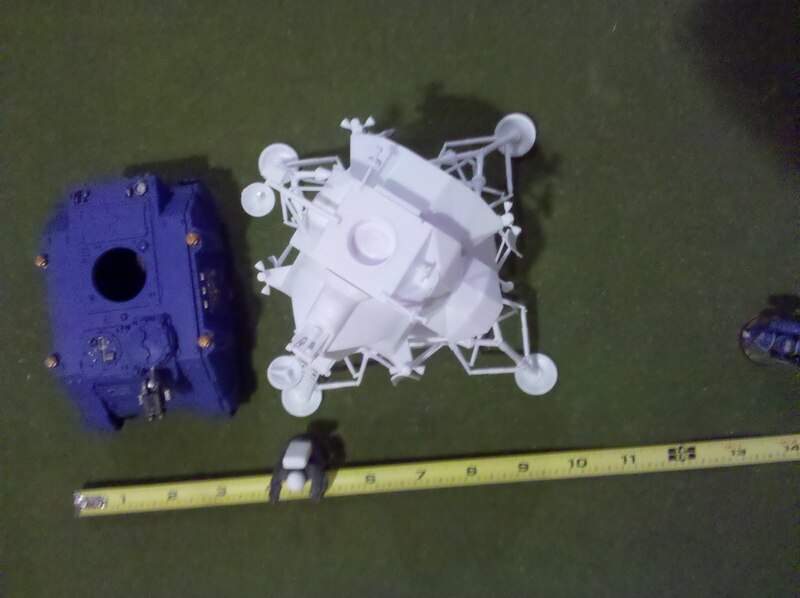 I did finally get the first Revell Lunar Lander full assembled, I still have yet to paint it. Also I have figured out the heads and backpacks that I will use on the marines. I've worked out that I can use the heads and backpacks from the astronauts included in the Revell set. Here are some pictures of them posed next to a rhino for size comparison. Unfortunately I don't have an assembled drop pod so I'm not able to demonstrate a proper comparison to that. I found that the astronaut helmets fit onto the rim of the mount of the power armor where head goes, to form a pretty good seal. Best pic I could get close up of the marine's head using my droid. Here's an overhead view to establish the footprint this takes up on the table. As I make more progress, I'll keep you guys updated along the way. In other news I've gotten into Malifaux recently, started a Resurrectionists crew led by Seamus. So far I have only played one game, but I really was surprised by how much fun the card mechanic was. Also while the basic game rules are not very hard to learn, each model has very complicated rules and they differ quite a bit from faction to faction so it can be tricky to learn how the models play. This friday I'll be taking on C-Swizzy in either Malifaux or I'll be having a rematch in the IRON ARENA!! playing warmachine/hordes. 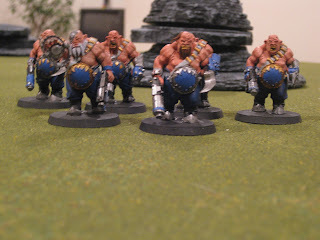 I've been also busy with a blood bowl league I'm in. I'm desperately trying to get my team fully painted by tomorrow, which is the last game of the regular season. So far, I'm in second place out of twelve with 6 wins, 1 loss, and 3 draws with an Orc team. I'm having a blast with the league, met a bunch of cool people who helped show me alot of neat tricks in the game. I'm a little disappointed that none of the other TEW crew are interested in it, but it just means I can expand my gaming horizons outward in other directions. The next league I get into, I'll be running a Khemri team using converted Tomb King models. I really don't have much to say about the GW boycott. Instead of screaming from my soapbox like most of the community likes to do about the issue, I let my wallet do the talking. I have expanded my range of games in the last few months and intend to explore them more. 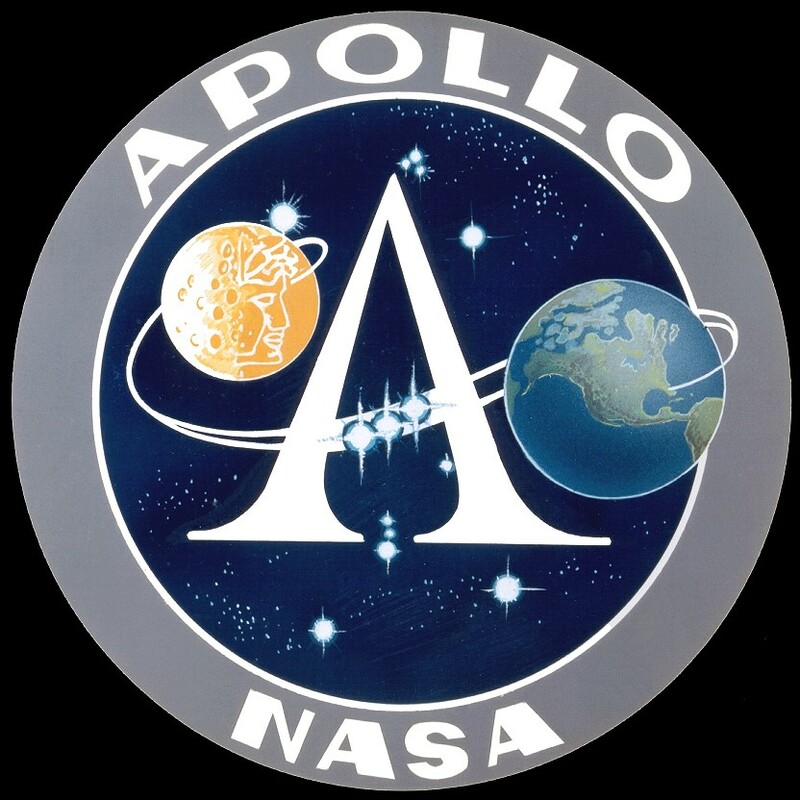 Also, the Apollo project has a minimal about of fresh GW models I have to get, as most of the stuff I'll get from Revell or resin cast (just the helmets and backpacks.) 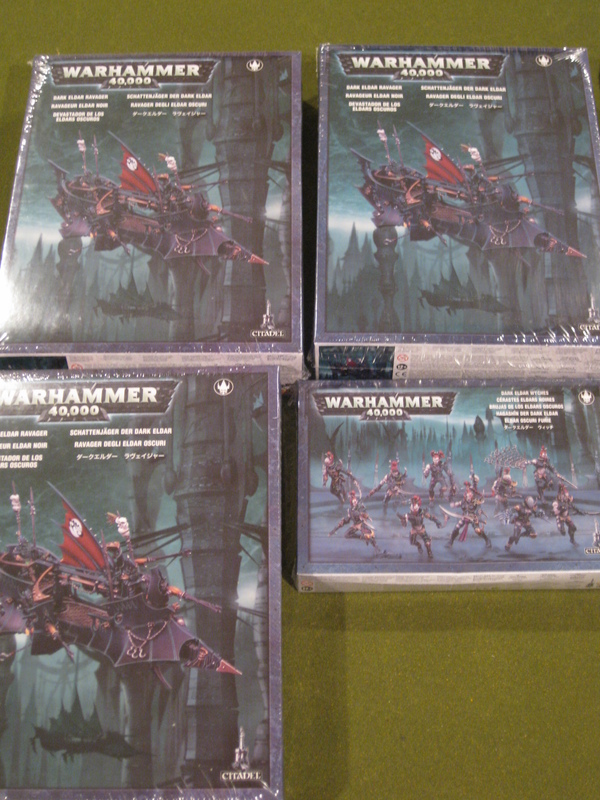 My main dilemma is with the upcoming Dark Eldar 3rd wave of models, especially between the venoms and the release of the razorwing fighter. I'll most likely just use a discount seller or the second hand market for those. It's been about two weeks since I announced my project and so far I'm making some slow progress on several fronts. 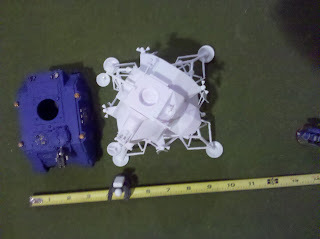 I ordered and currently have in my possession two kits from Revel models of the Lunar Lander. One I'm going to try and put together to both see how it looks and the size of it on the board., but so far haven't actually sat down to build it. The other I'm going to keep in parts as a way to figuring out citadel parts to substitute for components as best I can. For the marines themselves, I've decided upon a concept of how I wish to do that, as I want to keep it still mostly 40k models, I'm going to use the body of the space marines, but replace the helmets and backpacks with substitutes that are closer to the Apollo astronauts. I also plan to build some "lunar rovers" that will play as land speeder typhoons. I'm still trying to figure out how to model that based from a GW or citadel model. I'm thinking maybe some or the ork buggies for bits might be a good start. Right now the project is in the planning stages for not only the models, but also the list I want to build this for. The other day I tested a drop pod army just to get the feel of it and I learned quite a few things from the experience. I feel that to be able to put up a reasonable fight against opponents, I'm wanting to try out the following list I posted on the TEW forums. My original intention with this entire project was to have it completed and ready for Adepticon 2012 which I still plan to have it done for. However, I am accelerating my deadline to September, to be ready for the Grand Waaagh on board the USS Hornet Aircraft Carrier / Floating Museum. 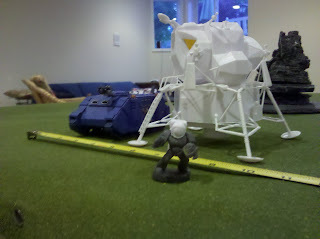 As it was the recovery ship for Apollo 11, I think it would be cool to have this army completed and competing there. As I make more progress, I'll continue to post more updates, along with any other hobby updates. I'm back...and going to the Moon! I know it's been a good 5 months since I've posted last on this blog but life has been a bit hectic for me and I haven't found the time or the focus to post at all. The few posts I came up with were used for the Eternal Warriors front page and I refuse to simply cut&paste blog posts from one to the other. A couple weeks ago I went to Adepticon and had an amazing time. Not only was it fun seeing all of the other podcasters, fans of the show, and playing tons of 40k and hordes games, but it was awesome seeing all of the cool armies and models people have done. Seeing the cool armies that other people have done have made me decide on my own hobby project. While I do enjoy the 40k fluff, I really want to aim at trying something unique, hence why I chose what I did. I know it's not quite 40k fluff or canon, but I aim to have the entire army be built with as many citadel minatures bits as I can and intend to use it at the 40k championship next year at Adepticon. While I'd like to try and compete with it as best as I can, the point would be a hobby project completely. It is a drop pod army based on this. 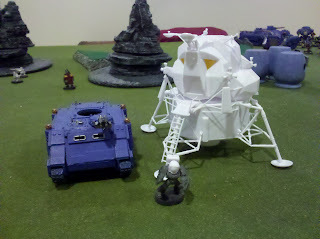 I want to build lunar landers as close to this as possible, but using as many citadel bits as possible. The first part of the plan is to order one of these kits from revell miniatures to get all of the pieces, to see what parts I can easily swap for for citadel miniature bits. Figuring out how to build the first one will be the toughest part. I figure that this project will help me post more regularly as well as the blog helping to keep me motivated on the project. From time to time, I'll post other random thoughts but it will still be mostly dedicated towards the hobby. Update, Hobby Progress, and Ogryn! Sorry I have been away from the blog for more than two weeks. I hit a period where I was running out of ideas that I wasn't using for The Eternal Warriors main page, where I contribute once a week on Tuesdays. I didn't want to just cut/paste entries from there to here or vice versa. I do have quite a few more ideas ready to go so I'll be posting much more regularly over the next several weeks at least. A few weeks ago I finally had my Ogryn conversions completed via commission from my buddy John (aka The Baron). I like how they turned out, though it will still be up to me to flock and base the models properly (which I wanted to do myself to match the rest of my IG army.) I used Warhammer Fantasy Ogre Bulls as they're much less expensive than Ogryn and in plastic. 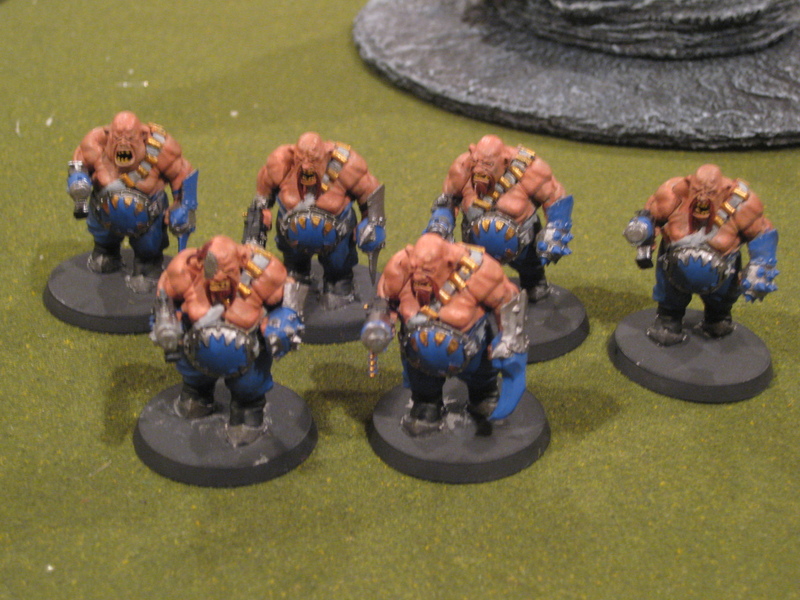 I can get a box of 6 Ogres for $40 retail, instead of the $25 for a single Ogryn blister pack. 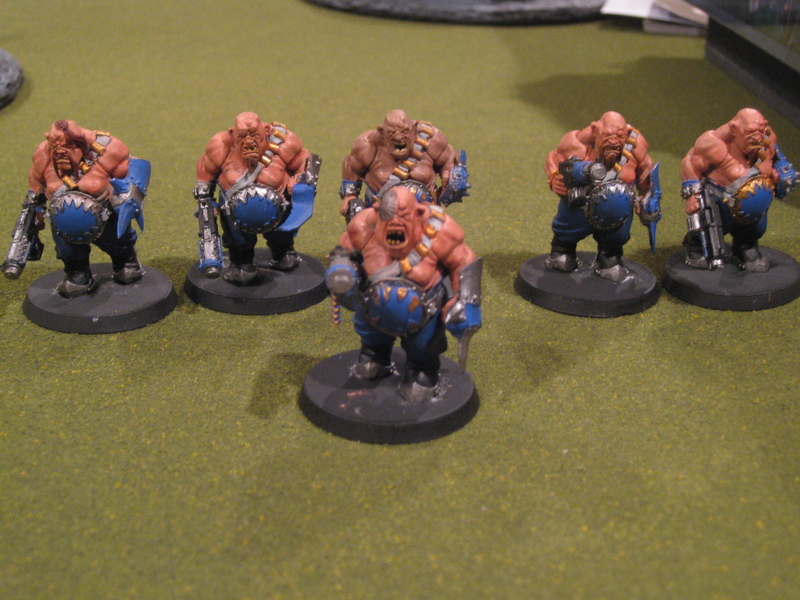 Kept them mostly the same as the fantasy versions, although the bandoleers were made from greenstuff and small pieces of plasticard, and then used Ork shootas as the Ripper Guns. Also conversions were done to represent the Bone'Eads (metal plate on the forehead). Squad #1 - Yes, the Bone'Ead is comin at you with a Bear Trap! Yeah there is a guy who is a different shade than the rest in Squad #3. He was done as part of a test, to see which color I preferred. Once the others had been painted the regular color, I couldn't stand to have the last guy repainted, so I kept him the way he is. His clothing is consistent with the rest of the army, just the flesh color is different. Last weekend, I played in a tournament with an IG list that utilized all 18 Ogryn. I did better than I expected, finishing 4th out of 10 players. Later this week I hope to have a detailed battle report posted. Also I received an order I had made from The Broken Forge. 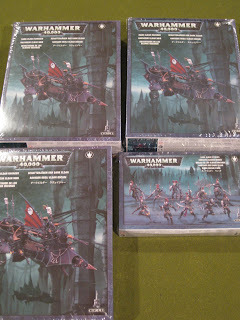 I received three Ravagers and a box of new wyches for my Dark Eldar. Very pretty models - Almost makes you forget about the Storm Raven. While most of my army still consists of the older models, I didn't have any ravagers, so I ordered three boxes to keep me covered. I have also been using the new wyche models as Hecatrix bloodbrides. I'll definitely be providing more updates on my hobby progress with them as I get them assembled and painted. There will be more posts coming over the next several days.